When the Danielian Associates team was asked by Lennar to design the largest product at Altair in Irvine, the firm knew it had to create an extraordinary interior living experience for future residents. At one point during the visioning process one of the firm’s architectural designers said, “Guys and Gals, this may be just the right opportunity to introduce a courtyard basement feature into a production home environment.” Boom. With 60’ x 105’ lot sizes already predetermined and a targeted move-up / luxury buyer demographic for the product, this basement feature was just the solution for delivering homes with very large open floor plans and private outdoor space within relatively small lot configurations. From that visioning team meeting, the Undertainment™ Floor was born. While courtyard basements are not necessarily new to the Danielian team or to custom home builders for that matter, bringing this element into a production home neighborhood in Irvine certainly is new. Featuring contemporary architectural styling throughout, Lumiere delivers luxury living at its finest with thoughtful details and seamless indoor / outdoor living elements within its six floor plan offerings. The old adage form follows function certainly applies, and each of the six floor plans were meticulously crafted with the homeowner experience in mind. The crown jewel of the Lumiere neighborhood is the Plan 3X and the Plan 4X residences which offer walk out, courtyard basements and ample amounts of natural daylight throughout the center of each home. These courtyard basements are not the stuffy basements that you might be familiar with, they truly go above and beyond which is why the firm coined the term Undertainment™ to describe these spaces. From the get-go, the design focus was on the interior architecture and the functionality of the spaces. Ranging in size from 1866 – 1985 SF, the Undertainment™ Floor features an outdoor courtyard with fireplace, game room and lounge, built-in wet bar, flex room, additional bedroom and bathroom. This space is just as ideally suited for entertaining as it is for everyday living with a heightened sense of distinction. 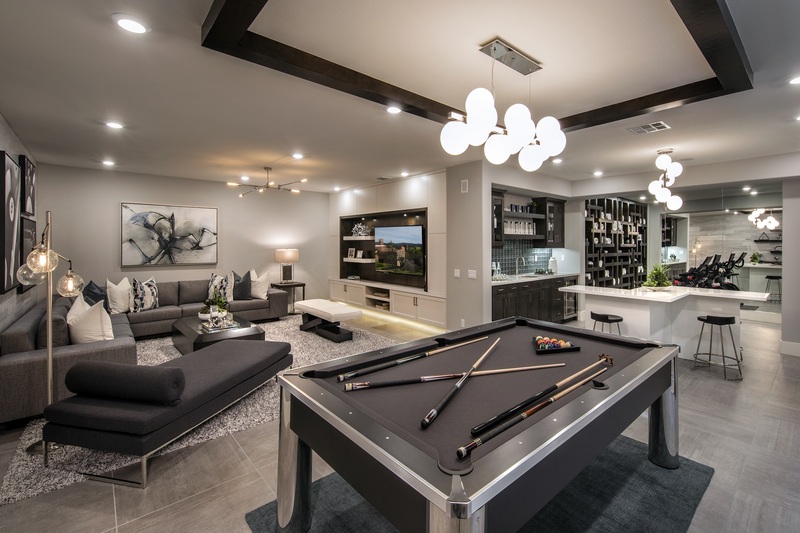 The 3X and 4X Plans Undertainment™ Floors are modeled with numerous options – a home theater, wine room, exercise studio, home office, and entertainment lounge – to give future buyers a glimpse into the endless customizable living experiences that are possible within this space. The first and second floors wrap around this private courtyard space, creating a perfect opportunity to leverage a central corridor of natural sunlight and celebrate it throughout the home. To create a truly seamless architectural experience, the elevation style and theming must be carried throughout the home and into the interior spaces. With so much indoor / outdoor living opportunities in these floor plans, the contemporary styling details have been integrated into both the interior and exterior architecture. The architecture and interior design teams worked together to create an environment that brings the story and design intent of these homes to life, while allowing the future buyers to live their own story and personalize their living experience. The Plan 1 at 3,471 SF offers single story living with indoor / outdoor living elements woven into the floor plan throughout, ideal for a luxury move-up or for downsizing. The second story is perfect for entertaining guests or relaxing with an over-sized loft that opens out to a second floor California Terrace. Plan 2 offers the flexibility of a master suite on the first floor harmonious an additional master suite on the second floor. The over-sized game room and adjacent California Terrace allows for everyday living and entertaining with large families. The Plan 3 and 3X range in size from 4,824 – 6,613 SF (the Undertainment™ Floor is featured in Plan 3X) and include Lennar’s popular NextGen® Suite. These homes allow for multi-generational living with an attached private suite with separate entrance, living room, bedroom, bathroom, laundry area and kitchenette. The suite is connected to the main home in a way that allows for as much privacy or connection to the heart of the home as desired. A grand foyer opens up to the large great room, generously over-sized kitchen island, and a large outdoor living space making this plan the perfect mix of private spaces and large gathering places.